A horror film from Great Britain came out in 2002 starring Jamie Bell (from Billy Elliott) and Andy Serkis. This was a film which went under the radar of most people, but not horror fans who tend to pick up on little gems such as Michael J. Bassett’s Deathwatch. Set during the height of the trench warfare in the Western Front during the First World War, the surviving remnants of a British Infantry company stumble upon a nearly deserted set of German trenches as they exit a fog-shrouded battlefield. Except for a couple of terrified German soldiers, the near-deserted trench only has dead German soldiers. As they spend their first night, it’s more than German soldiers they have to worry about, somewhere within the trenches something that’s hunting them down one by one. Deathwatch does a good job in mixing in themes of horror and paranoia as the British soldiers and their lone German prisoner must try to figure out just who or what has been hunting them in the trenches since their arrival. Signs of this unknown enemy could be seen in the dead German soldiers piled on to of each other and wrapped in barbed wire. Blood flows freely from within the muddy walls of the trench system though no bodies could be seen within these walls. The film does a great job of creating such a claustrophobic atmosphere for the characters that it’s natural to see their progression from being battle-weary but alert to being paranoid to the point that they begin to hallucinate and, at times, turn on each other. From the sound of it this film shares some similarity to Carpenter’s The Thing. As more and more of the survivors die, paranoia and suspicion grows amongst the rest as to who or what might be hunting them. The performances by the cast is good though nothing to write home about, but enough to convey the dread and paranoia sweeping through the trench. Jamie Belle as the teen British soldier with a conscience gives a understated performance while on the polar opposite is Andy Serkis scene-chewing his way through the bulk of the film as a soldier with sociopathic tendencies. 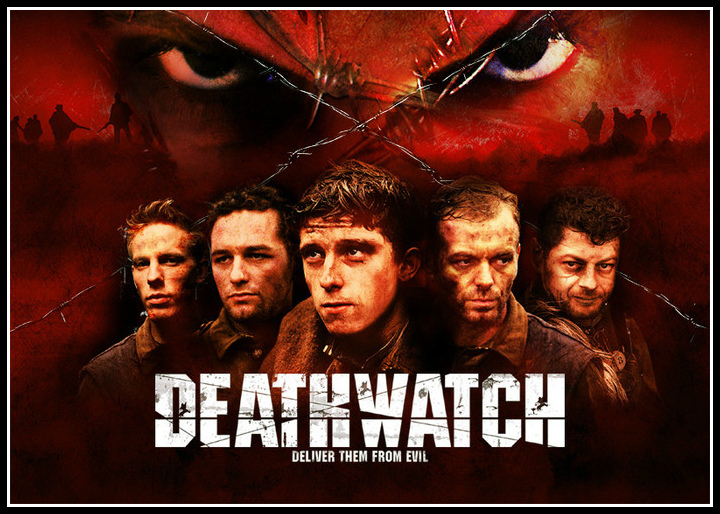 Deathwatch was a very good horror-suspense film that made great use of it’s World War I setting and borrowing themes and ideas from similar films. Michael J. Bassett’s direction kept the film moving and the film doesn’t skimp on the gore when it needed it to balance out the scenes of suspense throughout the film. It’s not a great film by any means, but it’s one of those little-known gems that one hears about and won’t be disappointed once they give it a try.